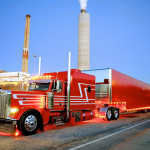 Lanita Trucking is known for operating some of the most beautiful trucks on the road. 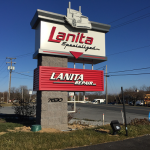 Located in Mt Aetna, PA, Lanita prides itself on the maintenance and reliability of their fleet. 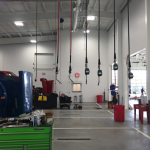 Lanita’s new service facility reflects the pride they have in their vehicles and the value they place on proper maintenance. 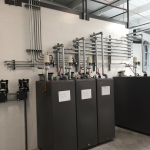 Haldeman Equipment was chosen to design and install the oil sytem for Lanita’s new (ground-up) service facility. Hose reels deliver 4 weights of oil, coolant, washer fluid and electricity to the shop floor. The Bulk storage tanks are located safely upstairs on the mezzanine. A space was left open for adding a product in the future. A remote fill system allows the 2nd story tanks to be filled from ground level. A 1400 gallon tank stores used oil outside while a smaller day-tank inside the building holds enough warm oil to feed the furnace. 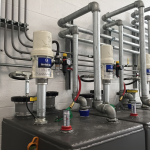 Haldeman’s exclusive Eliminator tank overflow system protects the main tank from overflowing and automatically transfers oil into the day tank as needed. High quality materials and attention to detail came together to give the customer a lube system worthy of the vehicles they service.